Countertop Glass Display Case - Locking w/ 4 Tiers - Ships Same Day! Each shelf can support items up to 155mm tall that weigh up to 5kg! 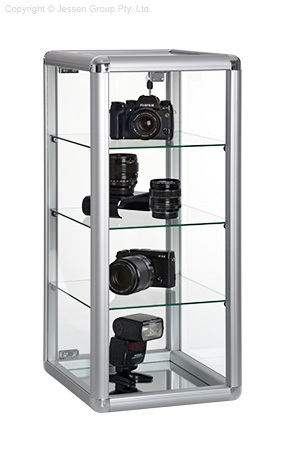 Use this countertop glass display case to secure goods whilst still providing a full view to visitors and potential customers! The glass showcases are made from 3.8mm thick tempered for safety, and the clear glass makes it easy to sell all sides of items within the case. The swing door is 240 x 620mm, making it easy to place or remove items inside the cabinet. The built-in lock helps prevent displayed items from unwanted tampering or theft, with the included set of keys giving the appropriate person easy access to the interior. The countertop glass display case, like many retail store display fixtures, is a tiered display, with (3) shelves creating four different levels for items up to 155mm tall. Each shelf is 285 x 295mm and can hold up to 5kg, easily accommodating the typical product placed within, whether in a shopping centre, gift shop, electronics shop or jewellry store. The shelves rest against aluminium pegs with rubber to hold the tempered glass shelves in place safely. The bottom tier features a mirrored base, reflecting both displayed items and light to help illuminate the cabinet. The tiered design helps you get the most out of your counter space, with the 360 x 310mm base taking up little room compared to how much can be displayed in the vertical cabinet. The cabinet has a modern appeal thanks to the silver aluminium framing. This frame pairs perfectly with the glass for a sleek aesthetic, and the rounded safety corners have a slightly different finish for additional style. The 12kg fixture is shipped knocked down to keep costs lower, with instructions included to help set-up the stand using simple tools. Order today for same day Australia-wide despatch from Slimline Warehouse with this and most other in stock products when in stock!